The tropical beauty of Cancun makes it a great travel destination for couples, families, and groups of all sizes. However, when planning your Cancun tours and activities, you may want to consider the size and intimacy level of the group you are traveling with. You may discover that private Cancun tours provide an even more personal and unforgettable experience or may even meet a specific need. Or you may discover that non-private Cancun tours are exactly what you’ve been looking for. Non-Private or Private Cancun Tours? Check out this list of common types of travel groups and use it as a guide to help you decide if you’d prefer doing private Cancun tours. Then browse Cancun Adventures and start planning your next vacation! The beautiful beaches of Cancun are the perfect backdrop for romance, and sailing to a remote island on a luxury catamaran is the cherry on top. Whether visiting for a honeymoon, anniversary, or other romantic getaways, this type of trip is best enjoyed without the crowds. For couples trips, and groups of friends who are all couples, we’d recommend trying our private Cancun tours. A trip designed around a company or business retreat usually involves specific elements, such as team-building activities, keynote speakers, or planning meetings. Many of our adventure tours provide great bonding and mingling opportunities for coworkers and can be tailored to fit your individual needs. However, these types of objectives may be more difficult to accomplish when other travelers are part of your group. For business retreats, we recommend private Cancun tours. Smaller groups and families may find that having other guests along helps them to open up and be more adventurous. If you’ve never ziplined above a rainforest or gone cliff-jumping, the extra support and encouragement may enhance your experience. For small groups, we recommend non-private Cancun tours. Large groups and families often bring the party with them, which means you probably won’t be looking to meet new friends. Swimming in cenotes or snorkeling with stingrays may be something you’d prefer to enjoy with your own group. For large groups, we recommend private Cancun tours. Few things are as much fun as traveling with a group of close friends. 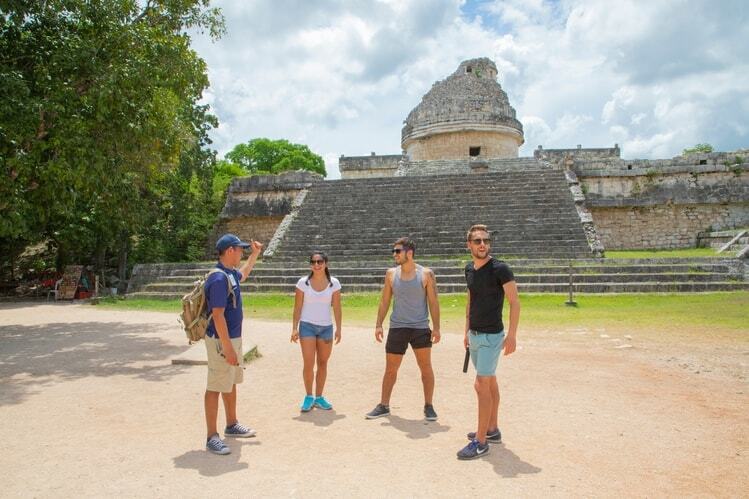 Exploring Mayan ruins and an underground river or climbing to the top of an ancient pyramid are great opportunities to bond with your best friends, as well as capture some great photos together. For close friends, we recommend private Cancun tours. Those who frequently travel and have adventures all over the world may love meeting people from different countries and swapping stories. High-adventure tours can be a lot of fun with anyone, so non-private Cancun tours could be the best option for you. Experienced travelers who love learning about history and prefer a quieter environment, may get more out of a private tour, where they can ask all their questions and hear the tales of the tour guides without distractions. In this case, private Cancun tours may be a better choice for you. Guests visiting Cancun for a special occasion with their loved ones can enjoy tours together without other travelers. Tours can easily be turned into an intimate gathering and celebration, and many of our tours include a meal. You can even party on a yacht on the way to the bubbly and impressive Isla Mujeres. When booking activities at the last minute, or when money is a primary concern, it is important to do your research. There is always the risk that openings will fill up or that something will be out of your price range, but with the variety of Cancun tours we offer, we are confident that you will be able to find exciting options that fit within your budget. Both our private Cancun tours and non-private Cancun tours are great options. The bottom line is that our private Cancun tours provide the most intimacy and the fewest crowds. Almost all of our Cancun tours can be made private and there are a lot of great options to choose from, no matter what brings you to Mexico. If you have questions about any of our tours, or you’re ready to book with Cancun Adventures, contact us today! Don’t forget to check out our special offers as well!